Nowadays, in-flight Wi-Fi is a key driver in securing customer loyalty and satisfaction among airline passengers in the region, said a report jointly released on August 8 by London-based satellite telecoms firm Inmarsat and market research company Populus. The report found that 67 percent of passengers in the region consider in-flight Wi-Fi crucial, while 78 percent of passengers said they would rebook their flights with a different airline if it offered high-quality Wi-Fi. Apart from attracting more passengers, in-flight Wi-Fi can generate new sources of revenue such as internet access, duty-free shopping and e-commerce, Li Wei, director of China Aviation Market Development at Inmarsat, told the Global Times on Wednesday. However, in-flight Wi-Fi is far from being commonplace among Chinese airlines. As of June 2018, there were over 3,360 registered airplanes in the Chinese mainland market, but only around 3 percent of them provided internet services. That level is far below in-flight Wi-Fi rates in North America, Europe and the Middle East, Li said. "Some Chinese airlines haven't anticipated the influence that internet services could have on their operations, while some hesitate accelerating the layout of in-flight Wi-Fi due to the emergence of problems like slow internet speed," she explained. The data created when passengers browse Web pages onboard Chinese aircraft that fly across the border would be stored in stations in China to guarantee information security, Li said. A lack of satellite resources as well as vague business models, however, make Chinese airlines' internet services lag behind those of international airlines, one industry insider, who prefers to remain anonymous as his company's satellite technology is still developing, told the Global Times on Wednesday. "In-flight Wi-Fi covers basic telecommunications services, whose strict and long approval processes are beyond people's imagination. Currently, only centrally administered State-owned enterprises have operation qualifications," the source said. As for satellite resources, he said that high quality internet services should be based on high-throughput communications satellites, but China only has one such satellite - the chinasat-16. "This satellite is not perfect enough to provide services," the insider said. At present, existing in-flight Wi-Fi in China is based on traditional satellites instead of the chinasat-16, with services too poor to guarantee basic network performance, let alone to help develop innovative business models, the source noted. Many Chinese aviation pioneers are struggling to survive in this regard. Beijing Business Today reported in July that Shareco, a subsidiary of HNA Group that focuses on in-flight connectivity, defaulted on the payment for goods supplied by e-commerce platforms. Shareco recorded a net loss for four consecutive years in 2017. Despite facing losses, industry players still feel optimistic about the future prospects of the industry, finding reassurance in positive signs. Chinese airlines carried 550 million passengers in 2017, up 13 percent year-on-year, data from the Civil Aviation Administration of China (CAAC) showed in February. Boeing predicted that China will need 7,240 new airplanes in the coming 20 years, the Xinhua News Agency reported in September 2017. Given China's huge aviation market, in-flight Wi-Fi can bring about great opportunities, with airlines, internet providers and e-commerce platforms all set to benefit, according to Li. A joint study conducted by Inmarsat and the London School of Economics showed that by 2035, planes with in-flight Wi-Fi will be in operation all over the world, creating a new market worth $130 billion and bringing additional revenue of $30 billion to airlines. 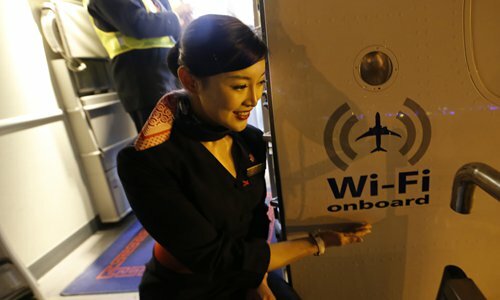 Now, China is accelerating the application of in-flight Wi-Fi. Following the CAAC's January announcement, which stated that airlines could decide on their own whether to allow the usage of electronic devices on their flights, domestic carriers such as Hainan Airlines and China Eastern Airlines have began piloting Wi-Fi services. "China's in-flight Wi-Fi venture has started late and it's understandable that it's laggard. But China's internet industry has been at the global forefront. With satellite resources and policy support, the country's in-flight Wi-Fi sector will definitely grow fast," the industry insider said.